Thinking about starting a Kickstarter campaign? Looking to crowdfund your next big project? Then join us this Thursday for the start of season 3 of KitchenParty! Joining us is Lisa Fetterman +Lisa Qiu (Co-Founder of +Nomiku). She raised over $600K on Kickstarter and is one of their most successful food-themed campaigns to date. We’ll also talk to +paul shustak Co-Founder of KOR Water and CEO of Rise. His new eco-friendly water bottle took in a whopping $261K! Want to know how they did it? Want to see what goes into planning and implementing a killer kickstarter? Join us live this Thursday! Post your question below in our comment section, RSVP on our G+ Event page or use our Hashtag #KitchenParty on twitter & G+ to chat live! RSVP on this page — then tune in live THURS (Jan 23) to watch the show live! We’ll add the live video to feed to this page before we go live! 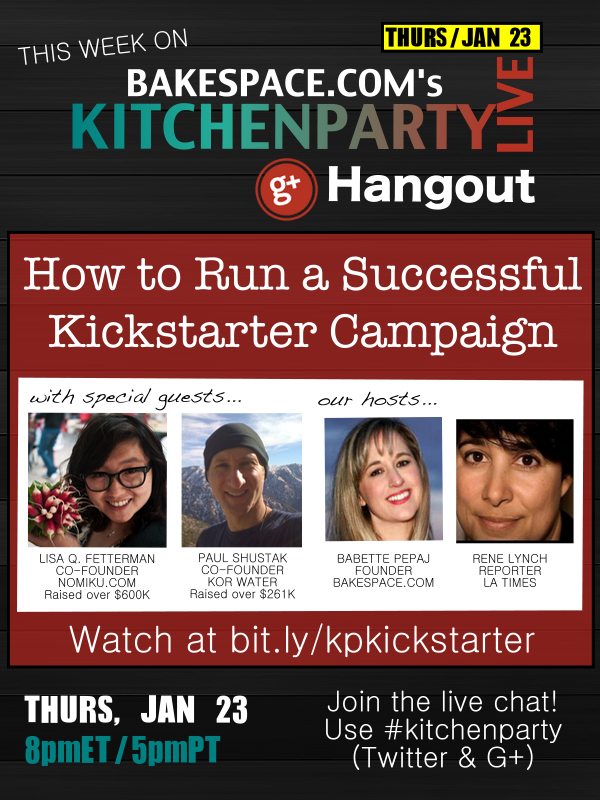 KitchenParty is a weekly interactive and live-streaming web series on Google+. The show is produced by http://BakeSpace.com (food community & DIY cookbook publishing platform & marketplace). Each week our live web series brings you the culinary world’s most innovative movers and shakers. The format of our show allows you to join the conversation – ask questions, share recipes, upload photos of your culinary creations. Lisa Q. Fetterman is the CEO and co-founder of Nomiku, a San Francisco-based startup pioneering one of the first immersion circulators for the home cook, allowing for sous vide in any kitchen. A food lover through and through, Lisa lead Nomiku to Kickstarter success, raising nearly $600K in 30 days making Nomiku one of the highest funded Kickstarter food projects in history. She loves hanging out with other makers in the community and cooking for her friends and family (sous vide obviously being one of her favorites!). Paul is Co-Founder of KOR Water and CEO of Rise. In 2013, he led the KOR team in raising $261,000 via Kickstarter for the Nava, a revolutionary filtering water bottle. The Nava campaign attracted over 4,000 backers, generating dozens of press hits and partner inquiries. The product has since become the company’s best seller. In 2014, Paul will be launching Rise, a mobile platform focused on personal achievement. 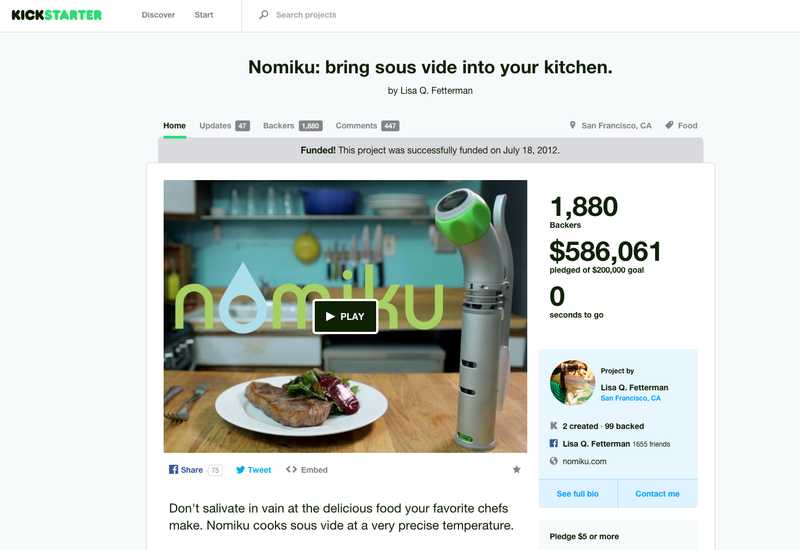 How can you call Nomiku a successful kickstarter when half their backers are yet to receive their reward which are now nearly 1.5 years late? !